Rackers Equipment Company has several scrapers for sale in Missouri. 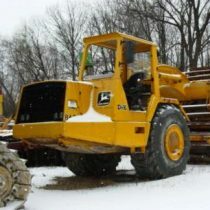 When you visit our location in Jefferson City, you will find a diverse selection of models from brands like John Deere, Caterpillar, and Terex. No matter what type of scraper or water wagon you are looking for, you can expect affordable prices, high-quality equipment, and an emphasis on customer service when you shop with us. Our team is here to make sure you find the right scraper to suit your specific needs, and we are always available to answer your questions. Don’t go another day without adding a reliable scraper or water wagon to your operation. For more details about any of these products, click on a specific model to view additional specifications. If you would like to order one of these scrapers, give us a call today to get started!